Silver Twin is a compact cotton/silver fabric for the protection against high-frequency radiation. Typical application as curtain, to sew clothes, handy bags, etc. Special feature: The frontside is made of white cotton, while the backside is densely woven with a silver thread. Despite the extremely high attenuation due to the dark silver threads on the backside, this fabric has a light gray frontside! 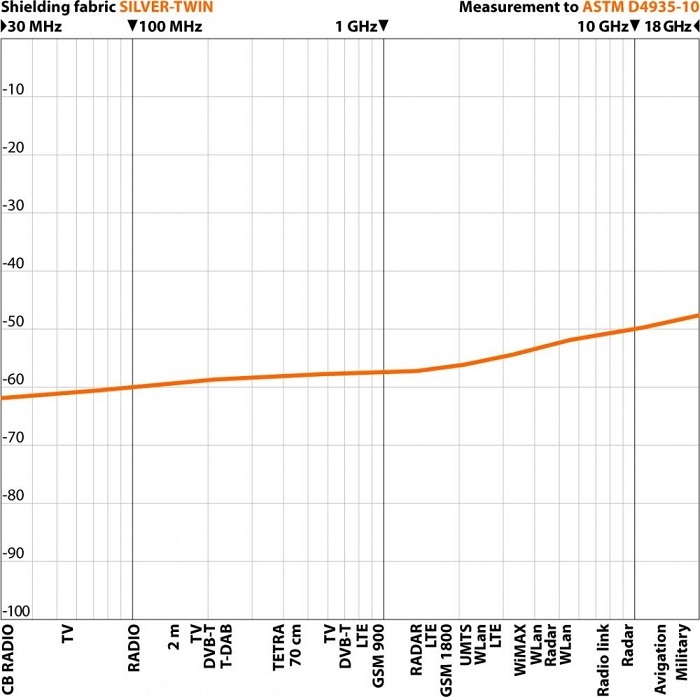 Maximum high screening attenuation, even at very high frequencies! Color: Frontside light gray, backside silver. Attention: Due to silver oxidation the front side can have very slight discolouration, this is no quality defect! Due to the surface conductivity this fabric can be grounded to shield low frequency (LF) electric fields. For professional grounding we recommend our Grounding-Plug EST.